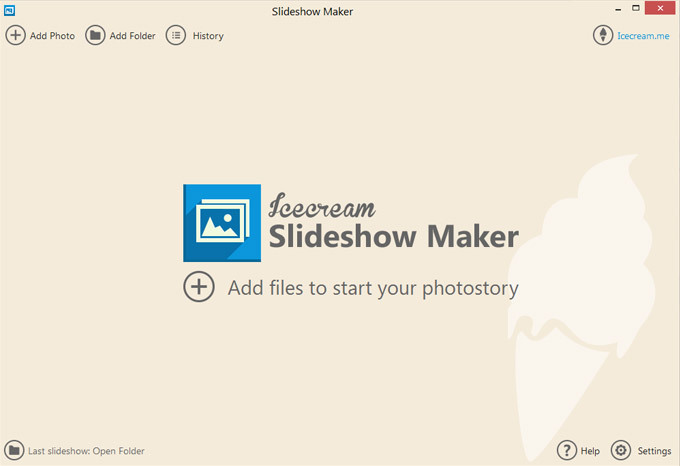 Icecream Slideshow Maker deals with JPG, JPEG, PNG and BMP images and helps you create stunning slideshows with zero experience. You don’t need to spend hours to figure out how the software works–a few clicks will help you create a slideshow presentation with audio which is close to perfect.The program allows you to set the desired resolution for images and adapt them for a slideshow even if all of them were uploaded in different formats, sizes and quality. Besides, you can keep an original aspect ratio of the images to prevent their stretching or distortion. Otherwise, choose the“Scale to fit”option to adapt the file for the size of your screen.It’s possible to set transition effects between the images to make the slideshow fancier. There are 26 effects available (for example Pixelate, Mosaic Spiral, Wipe, Zoom, and many more. If you don’t care about the type of the effect, choose the“Random”option and the program will set a random effect; if you don’t want to use any effects whatsoever, choose the“None”option and files will be displayed without transition effects. You can use different effects for each slide or set the same effect for all the files.Unlike the majority of free tools, Icecream Slideshow Maker is beautifully designed and appears to be an eye candy. Coupled with intuitive interface, its design makes the program a pleasure to use.